I have been an activist since I was about 13-14 yrs old when I wanted to become a rock star musician and change the world like The Beatles music ("Revolution") was and the alternative hippie movement. Although I played drums and sang vocals in many bands for 40 years, this was not to be my main activist form. In my 20s, I became more overtly political as a young naturalist-environmentalist and campaigned to stop the destruction of natural areas in the city where I lived, and fought for recycling and other environmental issues, including anti-nuclear and anti-war movements in my 30s and in my career as a biologist. Becoming a professional teacher in 1980 led me to critical pedagogy and a dedication to emancipatory work as a life-purpose. For over 25 years I have been an activist-educator for a decent fear management/education for all people. I wish to be known when I die for my achievements in researching and writing about the discovery that there is a universal global Fearlessness Movement, as part of a repertoire of methodologies of the oppressed (decolonizing our minds and lives), that is ancient and still creating new forms, but which has not been identified by anyone else as such. I have and am again ready to lead and/or co-participate in a community around the Fearlessness Movement. Now, my latest is to focus my activist energies in the Arts. As an artist and as an a/r/tographer and socially-engaged artist/educator interested in decolonizing methodologies and projects. I Follow closely the work of Paublo Helgeura's approach. As well, I'm deeply concerned with what is happening to Art and Education spheres, what's happening to aesthetics and "Quality" as I see it being lost, and a whole lot of other things that have to do with the sustainable and sane future potential of societies and the role of the artist. I am very interested in "life as aesthetic experience" and "art as life" across all sectors of society, to specific notions of "art of change," "art of leadership" and the "art of business." I'll save my in depth views and critiques, and projects (e.g., Art for Change Collective), for my essays that will be posted as free downloadable documents here eventually. As an activist-educator-scholar, public intellectual, I am also critical of much activism I see and have been part of. I am most interested in the qualities of emancipatory leadership (fearless leadership) and organizations operating beyond fear, as that was the study of my dissertation (2003). I am currently promoting and teaching a critical literacy to undermine the "culture of fear." The edge, which interests me is how artists can help with this project and how they can also, when unthoughtful, add to the human universal Fear Problem. As well as beginning a systematic attempt here to build a new vocabulary in my latest art activism projects, I am wanting to provide resources for art educators (and artist-educators) of all kinds, so they may begin thinking of ways to apply my models and philosophy to their own practices. So, I'll end this discussion with an example Lesson from a Unit (yet to be developed) on: TRANSLATING FROM WRITTEN LANGUAGE TO VISUAL LANGUAGE.My goal is to work collaboratively with others to develop this new language, curriculum, and pedagogy and practice it and evaluate it with art learners of all ages. If you visit this site every now and then, I'll be posting more curriculum and pedagogy documents (lessons, units, assemblages of ideas and artworks, and general resources). I offer you to contact me anytime to talk about these ideas and join the movement Artists for the Future and/or other projects (e.g,, Art for Change Collective). I am also very interested in doing more inquiry into the critical role of coupleships (intimate and working relationships) in (r)evolutionary movements, especially artists doing arts-based research work and activism (e.g., John Lennon and Yoko Ono Lennon), of which my wife and life partner Barbara Bickel and I see ourselves initiating and struggling to enact daily. We need, in the crises of the 21st century, a radically 'new' curriculum for a 'new' breed of artists and art educators (using those terms in the broadest sense) and we need to integrate the best of the 'old' forms but also to critique them and leave behind what is no longer applicable to the conditions of the times and an evolving future. Of course, my bias is that we want more highly competent artist-leader-educators (couples and collectives) out there in the world! AFTF, in my version 1.0 (everyone is welcome to create their own version) ought to have at least these six basic concepts at core, working together, in our awareness as educators of AFTF. Although the 6 concepts (VPCAAE) are intimately interrelated, there is a somewhat developmental and evolutionary direction indicated as well as the relation of pairs along the developmental trajectory. In later documents (below) I will ferret this model out further in detail. Below, I attempted a first (in progress) meaningful definition for me of AFTF (again, read my blog intro. above to get a feel for what AFTF means and its origin conceptually in the real world of contemporary artists like Ai Weiwei (also see Artsey organization on role of arts) and Marina Abramovic and for example, see documentary Woman's Art Revolution); other interesting groups are Free Art Society, and SenseLab, WildCulture check out the blog of nomad artist Vanessa D. Fisher (my daughter) and her podcasts with interesting artists, or my life-partner artist Barbara Bickel and Gestare Art Collective and a good resource on socially-engaged art/pedagogy. I see these as AFTF. I come to this AFTF as an artist practitioner, but also philosopher, theorist and curriculum and pedagogy designer. I ask: HOW will we create the conditions and curriculum for artists to become AFTF? Such a project begins in the first few years of life, and how we expose young people to art materials and processes and professional artists and art. 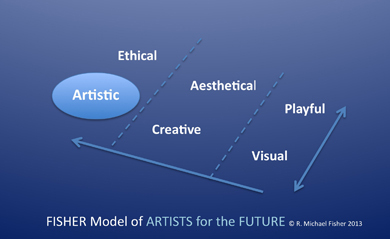 An Artist of the Future- is someone who is thinking critically self-reflectively and educatively about--and/or has chosen to be an artist, in particular, they will eventually choose to make art their profession (using "art" in this context for all the Fine Arts); they are concerned about the future and the role of the artist in shaping that future and being shaped by the future, and in solving some of the world's greatest problems utilizing their art-skills-intelligences (and the model of Figure 1) for working across professions and disciplines, and various sectors of society, in ethical relationships, and across boundaries and barriers of all kinds. Some may call these AFTF, collaborative artists, artist-activists, artists for social responsibility, socially-engaged artists, community-based artists, artists without borders, cultural workers, visual cultural critics, arts-led researchers, and so forth; they appear in many forms and are in a committed process to the profession of being an artist that continually trans(per)forms their profession and self by constructing and deconstructing the very nature and meaning of art, Art World, artist, artist-educator, art education and so on. If you read Fuller's prophetic vision, and take-it-in deeply, you'll perhaps take the 'call'--that I have re: comprehensivity. It is an interesting concept well worth studying, but I won't elaborate it here in this brief webpage introduction. It also means holistic and integral, other concepts that frame the Artists for the Future and the requirement that is being demanded for their success and applications of their skill-sets to larger human-environmental challenges of the 21st century, a century that the matrixial artist-activist-psychoanalyst-theorist Bracha L. Ettinger called an "era of trauma." Basically, we need well-rounded, healthy (e.g., ethical and non-ego-inflated) highly competent artists that have retained their "natal capabilities"! art country- refers to but is expanded beyond "Art World" (as normally used today), and entails the territory, stable and unstable, appearing and disappearing, wherein artists practice their profession in all its aspects, as a discipline, and as a cultural worker in the public sphere and human being in the private sphere; the premise of the term's usage is that in "art country" artists ought to rule primarily but not only (collaborations are great), and yet thus art curriculum of all kinds ought to emerge from art country not Art World nor not Art Curriculum from Departments of Education (gov't and/or schools, or higher ed.and academia) as these have become too embedded in State-Corporate agendas that are far too removed (if not quite distorted in views of art is and what artists are) from art country any longer to be relevant and appropriate to AFTF; this territory is inherently one of many voices, typically not in total agreement on anything including the definition of "art" and "artist"
AFTF discourse- is a particular type of perceiving, thinking, making/performing, self-educating, and voicing (practices in all forms) that is inherently located in the standpoint of art country; and thus, is critical of dominating discourses on art and the artist and core concepts (e.g., VPCAAE) in art curriculum and pedagogy, which marginalize AFTF discourse and its role in the future of Art and human-global education, health and survival and beyond to thriving and innovation; a few exemplar AFTF quotes: from contemporary Chinese artist Ai Weiwei: "I spent most of my effort liberating myself from being an artist to become a real human being," and contemporary American artist Marina Abramovic: "Artists have to be warriors.... to conquer themselves and their weakness.... It's all about state of mind from which you are doing this." Imagine a global AFTF campaign, where an AFTF T-shirt/logo is created and spread, where young art learners and old are wearing this message, symbol, and identification in an embodied activism that claims the territory of the artist in education and in society and the future! Send me your ideas for this T-shirt/logo and how to fund that campaign. This is not a finalized nor "tested" activity, but rather theoretical and intuitive--an insight I had this morning, for use with AFTF young learners or anyone studying visual arts (in the largest sense of that term). Send me your ideas of how to add to this, critique it, and improve it. Try it out. Preamble - there has to be a better way to get across the most basic fundamentals of what it means to be an artist to young art learners and others right from the very start of their art learning experiences; after watching several contemporary artists in their studios doing art and talking about it in an informal interview process (see the YouTube documentary DVD Art City: Simplicity) I was most taken with American artist Richard Tuttle's controversial art, and most basic post-minimalist playful way of approaching art, even though he is well-trained as an artist (and now highly successful professionally). I thought of how he exemplifies children's play (natal capabilities, as Buckminister Fuller calls it), and what artist-educator and art ed. professor George Szekely emphasizes in teaching art/play as primary with his preservice teachers; Tuttle's work, in my view is exemplar in demonstrating visual language vocabulary and use at is most basic and SIMPLE level, but in his own words, he is attempting to demonstrate and embody "simplicity without being simple." AFTF will have to be 'masters' of the unknown, of chaos and complexity, and finding the elegant, simple creative solutions that we'll need. Simplicity without being simple. This experiencing of watching Tuttle's art process and his artistic thinking reminded me of the simplicity-in-complexity natal capacity of the great holistic postmodern anthropologist-epistemologist Gregory Bateson. who argued natural learning for all organisms is finding the "pattern that connects" in all the complexity of what is coming into our sensory systems from the world. Tuttle is offering a model, in my view, for this activity (theme for lessons) of Translation from Written Language to Visual Language. Of course, the best way to understand what I am saying (or Tuttle is saying about his art and process) is to watch him work. And that's where this lesson plan starts, have the art teacher show a clip of Tuttle on DVD to the young art learners from the start of their art classes. One cannot watch this too many times, over and over, and/or with different clips of Tuttle (or other similar artists). After 5 min. of watching this clip, I believe that art learners will already be readied (and reminded) of what basic visual art is about. Purpose: to encourage art learners to understand the translation from the dominant written language codes to visual language codes; in other words, It is about visual language learning and how written language (e.g., letters, words, phrases, sentences, etc.) -- this skill is the same as "code shifting" that is a concept used in multi-cultural studies, where we learn to change our cultural codes of behaviors depending on the context we are in-- this skill can be applied to language code shifting in terms of moving from aural-written language to visual language proficiency. Basic Method- I encourage art teachers to be creative with materials and uses beyond my descriptions here, if cut out letters or blocks are not available, then use a sheet of paper and crayon markers: (a) show learners a video clip of Tuttle's interview and art-making in his studio (emphasizing, as he does, art for him is "creating something that wasn't there before he created it"), and there's no need to say anything unless the students ask questions, (b) have the learner examine letters (individually cut) and/or blocks with a letter on it, (c) have them create a 'word' with these letters that they know and one that they made up, (d) then talk about how they can break out of the linear format of juxtaposing these letters (which is likely going to be their habit of organizing them with your assignment in (c), (e) encourage various configurations of written texts with letters, (f) once they have settled on a particular configuration of their own, ask them (and encourage class discussion if peers are around them) "is this a satisfying arrangement?" and thus, begins the basic notion of assessing quality, aesthetics, and "just rightness" of the art object (encouraging them to change their arrangement after this reflection and discussion if they want to, (g) let them create several configurations, and see how many different ones they can come up with in two minutes (these could be photographed by the art learner or teacher/assistant to create a series of photo-images of this process to be use later in other lessons, (h) then talk about what art is (using Tuttle, if you want) at its most basic process by demonstrating the translation from aural-written language (e.g., letters, words, etc.) to visual lanugage--to start this process of translating ask the learner to create a visual image/object in their mind that would represent one of the letters they have been working with (e.g., a square box is imagined to be a letter 'T') and then have them draw on paper the visual code/translation of the letter they chose to translate, (i) now in the visual language of art and aesthetics, the playful and primal modality, have the learner translate all the letters in their words that they made in the previous exercises, so that they begin to create a visual mapping of 'letters' and 'words' and they can re-arrange the visual translation to suit themselves to find a satisfying arrangement (and/or the "best" and/or most "beautiful"), (j) then, ask them to reflect on what they made in visual language comparing it with written language construction prior--ask them which they like best, why? Ask them if visual language "makes sense"? Is art supposed to make sense? etc. (k) introduce the concept (art approach) of what is called "assemblage" and how visual language, like aural and written language, is foremost an "assemblage" and emphasize that artists construct and deconstruct assemblages all the time, as do children (e.g., building something and then knocking it down, or dressing up and dressing down)--play and creativity are rooted in this way of inquiry (art-as-inquiry and research)--and what is it that can be learned from doing this?--at best, it is a process of not becoming "too precious" with what an artist (designer) creates and always being willing to adapt it and change it for something more interesting or "better" for a particular purpose; the AFTF and the art profession is one of 'dressing up' and 'dressing down' everything ongoing and there is simply no other profession one can go into that does this so thoroughly and by definition what "art" means as does being an "artist"
Enrichment Activities- discuss the neolithic artists and show their work, e.g., visual language, and/or the way writing evolved in various cultures around the world as 'pictures' (symbols) before a more structured trimmed-down discursive (less aesthetic) text formulation (e.g., Chinese characters and painting/writing as one and the same early in their cultural development)-- also, for more sophisticated learners you could read a passage of poetry of poets who move language around and letters (purposefully misspelling and disrupting grammar rules) and spacing so as to create visual images from texts, and read an excerpt from James Joyce who was a "genius whose invention is that of going through language, while omitting its imaginary dimension, and bypassing the territory of meaning and sense. Joyce omitted this imaginary consistency and vacated the function of symbolic meaning" (according to the philosopher Ruh Ronen)-- introduce more on use of "assemblage" and "collage" and "montage" as approaches to visual language and the most basic performance of artists and this is one of the most important skill-sets of the AFTF and innovation and finding "simplicity-in-complexity"